I've just sat through an entire hour long video entitled "Visitors from the other side" which is basically an interview alongside clips of speeches made by a guy called Tom Harrison, who was the son of materialization medium Minnie Harrison, as well as interviews with other witnesses to her mediumship skills. Materialization mediumship is where phenomena is produced of an actual physical entity or spirit person using the subtance of ectoplasm. I have to say this is actually an amazing story and a lot of the time I admit my brain was in overdrive thinking "this has to be fake" and "this cannot be real". It was amusing at one point toward the end of the video when one lady was asked how she now feels about death reply "It sounds strange but I'm actually quite looking forward to it!". I think that speaks volumes for how convincing the evidence presented in the video is. It is extraordinary to hear of how these people witnessed full body materializations of those who had been dead for MANY YEARS just being right there in the room- talking to them, able to touch them! In the video, many photographs are presented which were taken during the seances. We get to see examples of spirit writing, and toward the very end of the video we are treated to an actual audio recording which was made during one of the materializations. This is absolutely unbelievable and I think it is fair to say the vast majority of people are completely unaware that this level of proof for life after death is available and has been for many, many years. If you have a spare hour I'd highly recommend watching it. where I discuss many spirit phenomena, some of them bringing information about Brazilian mediuns of physical effects. Thank you for your comments! I will certainly be reading your blog, which looks very interesting. I am particularly interested to find out more about Brazilian Mediums. It is amazing just how many increadible, yet not always widely known examples of spirit phenomena and physical mediumship exist from all over the world. 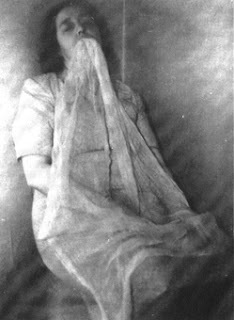 love the picture of the lady with a net curtain in her mouth, it even has a hem.